Your final photo of the Shasta is not of the 2009 Airflyte 12 but of the Shasta Airflyte 16. The tip off is that the Airflyte 16 has propane – as your photo shows – and the Airflyte 12 does not. Also, the Airflyte 16 is longer. The two Airflyte 16’s that you mention might be the only two ever manufactured. I have seen no mention of Airflyte 16’s sold prior to 2012. We own an Airflyte 12 and really like it. It draws lookers and we give many tours. I have been trying to learn the total number of Airflyte 12’s manufactured and have seen two figures, 114 and “around 180” for those manufactured in 2009. I have seen advertised sales for 2011 Airflyte 12’s and I speculate that, as with the 2012 Airflyte 16’s, the 2011 Airflyte 12’s were assembled from left over parts after manufacturing otherwise had stopped. If anyone knows the exact production numbers for the Airflyte 12 and 16 I would like to know them. We own an Airflyte 12, no one believes it’s a real “Shasta”. We truly enjoy ours. We’ve only heard that 112-114 were made, but never anything official. I’m surprised they didn’t sell like hot cakes. I am in the process of re-doing a 1972 Frolic (which I’ve dubbed the Pink Paradise). I am in love with vintage campers and love your site. We just went to a Vintage Camper Rally here in the Finger Lakes this weekend. Check out my post! Just getting strted. Have not decided what I am going to buy. I know it needs to be used, and a low price. I am a single woman. I am researching life on the road! I too am looking into purchasing. I am recently widowed and would like something small and used. Not looking for life on the road but lots of adventures. Always loved camping but getting too old for a tent. Let me know what you find. I too have a 2009 Shasta 12 Airflyte. The dealer I purchased from told me they only made 104. I do disagree with Robert about the Airflyte 12 being all electric. Mine uses both gas & electric. The gas heats and runs the fridge when not plugged into electric. I too get to “show off” our little gem wherever I go! Unfortunately we recently lost our spare tire cover with the Shasta name and can’t find a replacement. How do you convert the table to a bed? Just got one and can’t figure it out! Keep in mind this trailer came out in the fall of 2008, just as the economy crashed. The RV market in general went into a tailspin. I attribute that to this product’s demise as much as anything. I own one and love it. Selling it now b/c I need something a little bigger. Kids keep growing on me. I was recently given a Shasta Astrodome. I need info to determine its “made” date. Read on another blog that they were made in ’62 ’63 and ’64. Saw a pic. online of one at a rally supposedly a ’61. How do I find accurate information? Mine has a single seat across the front with two tables that fold up on each side in front of couch, not the two banquette seats with folding table. Also need pics of interior to see what is original. Mine does not appear to have any add on’s inside or out.Thanks. Nancy – Are you on Facebook? If so, I’d suggest joining the Vintage Shasta Trailers group. They have nearly 4,000 members on there and would be an excellent source of information. If you’re not on Facebook, do visit Tin Can Tourists: http://tincantourists.com. Explore the site and look for the section under RVs and Trailers. There is a section that helps identify your trailer, or also contact them for assistance. Sorry I can’t be of a lot of help when it comes to vintage trailers, as I tend to focus on newer small trailers. I still do what I can to help those who ask me for assistance with a vintage trailer they have. Just purchased s 12′ 2009 today that appesrs to be new. There is not a discernible mark on it anywhere, Even underneath the frame and suspension is as shines as a new penny. Paid $14,000-amazing considering its age and original sales price-and are happy with the deal. We look forward to showing it off-our old/new trailer. By the way, it includes an external portable on-demand instant water heater(propane powered) made by Triton that just ads to the charm. I’ve one!! A 2009 Shasta Airflite 12 as of Jan 2017! Love it!! I travel at least once a month and no problems so far. I watch over her very carefully because no one knows anything about this model!! The owner’s manual that came with my 2009 was a a rather generic forest river manual, but I’d be happy to xerox it if you’d like. We are in desperate need of the 2009 Manuel for it. We will pay top dollar any suggestions? We found several from Coachman, Forest River etc but they have blank pages and are not specific to that 2009 model. I have a 2009 too and it’s great….sliver with teal interior. Bought it new in 2010 and it’s been a lot of fun! My owner’s manual is pretty generic (forest river), just covers any trailer they sell, not specific. They only made like 114 of them before the R-Pod took it’s place. If you have any questions, feel free to email me, I know the little quirks that it has, My fridge initially had the 12V wired up backwards at the back of the fridge, so it wouldn’t run on 12V. I’ve met two other owners who had the same thing. Oh Forest River!! Sorry to have gone off the radar…. We’re still going strong just hook up kick the tires check the mirrors and go! Been through TX, NM, AZ, CO, up to and through northern Wyoming! New season of glamping about to begin going east and north then west and south Silver and teal? mine too!! 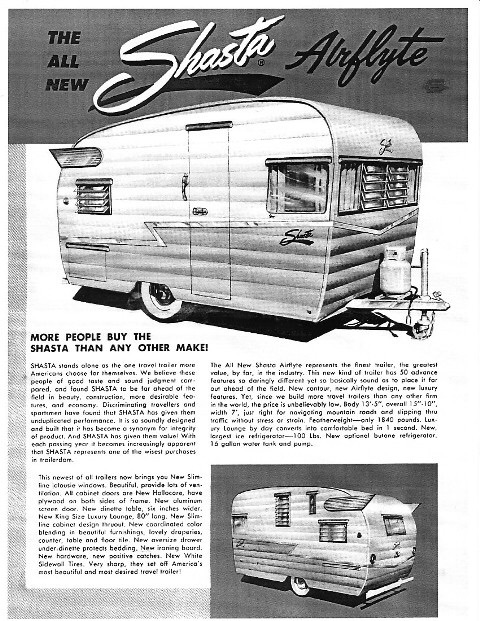 re the Shasta Owner’s Manual is by Viking Recreational Vehicle, LLC and is very proud of the 2009 Shasta Airflyte. ‘Revised 9/08’ Nowhere does it mention Forest River 😉 I’ll be glad to copy and share. LessieLou1@aol.com its what we do, right? I had a decal made ‘by Coachmen/Viking’ that I’ve place next to the back Shasta metal plate emblem. As ya’ll know, these ‘coaches’ do get a lot of attention. FYI…the wings are very, very heavy. How do u change the lights. Mine is it over the bed can’t figure it out. We just bought a 2009 but it didn’t come with a manual and I’m having a hard time finding one online. Any suggestions? We have one of these and LOVE it!! The manual that came with mine was a generic forest river manual. But I’d be happy to xerox it for you if you’d like. 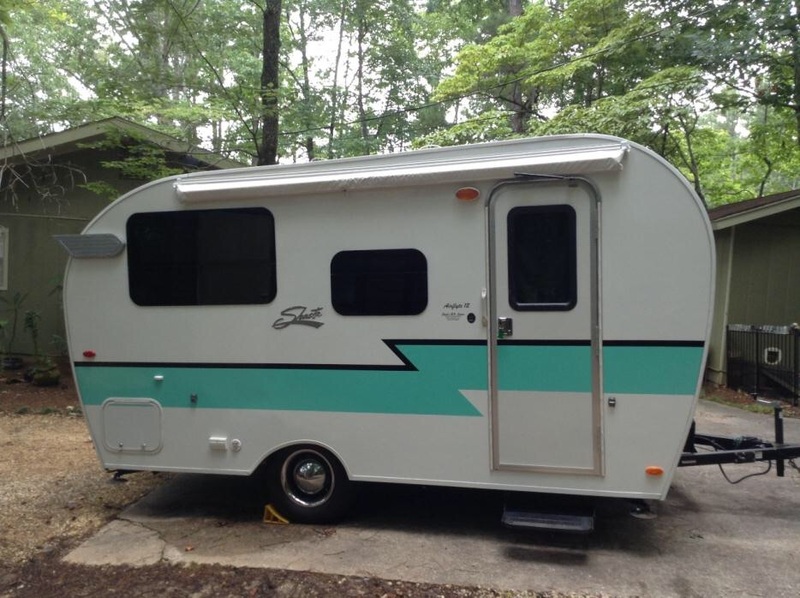 We have a 2009 Shasta airflyte 12 , love it! Seem to have been hit by hail storm and damaged the outside bubble on the skylight , if anyone knows where I can find one possibly two, ha! We have the three way fridge , propane and have added two solar panels to the roof so we can park anywhere and still enjoy a movie at nights. Thanks for the help! We recently bought a 2009 Coachmen Shasta Airflyte 12. Does anyone have tips on keeping the fridge cool when traveling? I can’t believe they would make something that would not keep food cold while traveling. Many of these trailers (like mine) had a manufacturing error in the wiring harness where the 12V wires coming from the battery were reversed at the back of the fridge causing it to only work on 110V. You can tell if you disconnect the trailer from shore power, then check to see if a LED light in the fridge is on. Then try turning the thermostat until the compressor starts. No compressor noise at all with it turned up all the way? Then the polarity is reversed at the back. I reversed the wires on mine and voila, it began working on 12V. I know of another Shasta owner with the same thing. You have to take out the perimeter screws around the face of the fridge and carefully slide it out until you can access the back (two person job). While someone supports the fridge at the front to avoid damaging the wood fascia, swap the two wires coming from the 12V source (one red, one white) at the spades marked “12/24VDC + and -“. I have some pictures if you need assistance….email me at dgebow@comcast.net. Even though it’s in the UK, they sold me the parts I needed after I set up an account and they emailed me back an order confirmation. I have a 2009 shasta airflyte 12 no issues except the one I created. I changed all my interior lighting to led, less power/heat. In the process I cracked one of the lens on one of my ceiling lights…..does any one know where I can a new ceiling cover lens. Hey Dave, Thank you so much for the info I will check it out. OK, so from what I’m reading here, there were actually two Airflyte 12s produced… one that was all electric and one with propane. Mine is all electric and I wish I had the 3 way fridge. Has anyone else experienced rapid battery drain from using the fridge on DC? I’ve seen up to 3 configurations of the Airflyte 12. Some have a propane water heater and furnace but a 12V fridge. And another that had a propane furnace but a 110V water heater and 12V fridge. Seems like Coachmen couldn’t make up their mind? Lol. Mine is all electric. I had to install two Trojan T-105 batteries in a Century Plastics dual battery box in place of the single 12V battery to run my fridge for a reasonable amount of time. FYI- the fridge draws approx. 3.5-5 amps when running. I find that when boondocking I need to run my generator a couple hours a day to top off the batteries. I recently got two portable 100w solar panels (they put out 12 amps in full sun) recently that completely run the fridge during the day…now I generator charge about every other day when boondocking. And avoid taking your batteries below 50%…and never to 0%…you will dramatically shorten their life. I also found that a proper battery monitor such as the Victron BMV-700 is an absolute must with this all electric trailer. If you have more questions, feel free to email me at dgebow@comcast.net. Happy camping! Couple of questions about the 2009 shasta airflyte 12 is there a winter cover that will fit these trailers, and I would like to put a rear bumper on our trailer has anyone put one on, possibly welding to the frame where the triangle supports are so the trailer won’t bottom out if the trailer is raised to high. Looking to weld a bracket to the frame and then put a square tube aluminum bumper on. Comments, suggestions appreciated, was looking for an airstream back bumper to keep the retro look put haven’t had any luck. 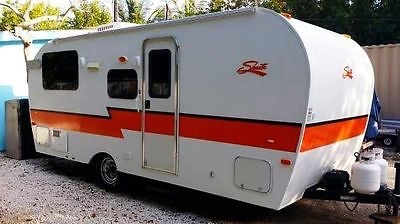 Just buying a Shasta 2009airflyte and can’t wait to enjoy camping in it. My wife and I are looking at a2009 Shasta Airflyte 12 for sale. I was doing a bit of research on them and those that own them seem to love them. Are replacement parts hard to find? What was the suggested list price for the 2009 12 foot model new? What would the 2009 in good condition sell for today?